Although PermaBilt® is best known for building new buildings, occasionally we build extensions to existing buildings. This was the case with our Snohomish Washington client who wanted a lean-to added to his existing pole barn and horse arena. This was not the first addition to the original pole barn. He had previously added an arena, trophy room, lean-to and addition. This new lean-to was to be used for a hay/shavings area. 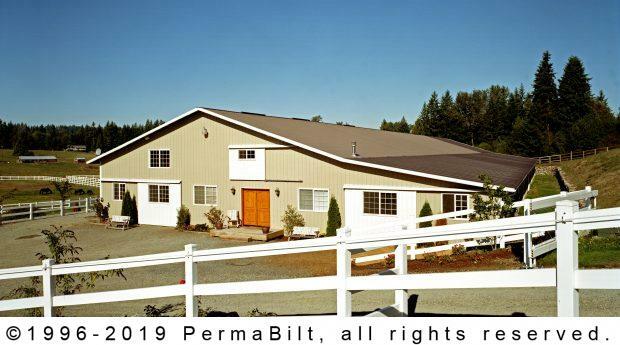 Our PermaBilt® Building Representative met with the barn’s owner on multiple occasions to decide on a design and size that would fit the owner’s budget as well as match the quality and appearance of the existing building. Once the design was settled upon it was a matter of our construction crew taking down the exterior wall and adding the 24’ x 24’ lean-to addition. Also the roof of the lean-to was blended into the existing roof. When the addition was complete the owner was delighted with the outcome. His only hope was the new lean-to was going to be the last addition to his beautiful barn for the foreseeable future.